I could live on this. It’s so easy and yet utterly beautiful looking, I always feel better after eating it. The pickled vegetables are a great thing to know about. Make extra and keep them in the fridge for eating at lunch. You can make this dish with mackerel and chicken fillets too (chicken needs to be cooked for 20 minutes). 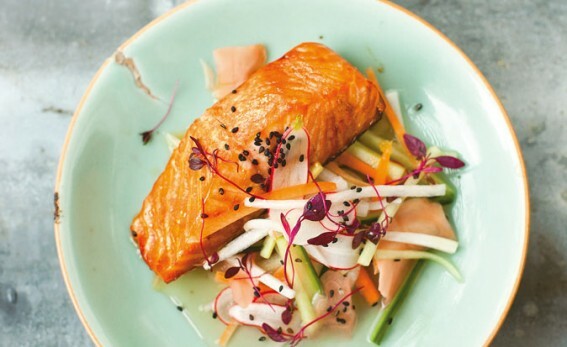 For the salmon, mix the soy sauce, sugar, mirin and sherry and stir to dissolve the sugar. Put the fish in this, turn to coat, cover and put in the fridge to marinate for 30 minutes. To make the vegetables, heat the vinegar and stir in the sugar until it dissolves. Set aside to cool. (Or, if you are in a hurry, you can just whisk together the vinegar and sugar in a bowl until the sugar has dissolved.) Keeping them separate, cut the cucumber, carrots, radishes and mooli into matchsticks, each about 5cm (2in) long. Sprinkle the salt on the cucumber and put it into a colander for 10 minutes, Rinse and pat dry, then add all the vegetables to the vinegar mixture and toss to combine. When you’re ready to cook the fish, preheat the oven to 180°C/350°F/gas mark 4. Bake the salmon, in its marinade, for 12 minutes; it will remain moist and only just cooked in the middle. Sprinkle with the black sesame seeds. Add the pickled ginger and microleaves to the vegetables, toss and serve with the salmon. Offer rice on the side.